The muscarinic acetylcholine receptor subtype 1 (M1) receptors play an important role in cognition and memory, and are considered to be attractive targets for the development of novel medications to treat cognitive impairments seen in schizophrenia and Alzheimer’s disease. Indeed, the M1 agonist xanomeline has been shown to produce beneficial cognitive effects in both Alzheimer’s disease and schizophrenia patients. Unfortunately, the therapeutic utility of xanomeline was limited by cholinergic side effects (sweating, salivation, gastrointestinal distress), which are believed to result from nonselective activation of other muscarinic receptor subtypes such as M2 and M3. Therefore, drug discovery efforts targeting the M1 receptor have focused on the discovery of compounds with improved selectivity profiles. Recently, allosteric M1 receptor ligands have been described, which exhibit excellent selectivity for M1 over other muscarinic receptor subtypes. In the current study, the following three compounds with mixed agonist/positive allosteric modulator activities that are highly functionally selective for the M1 receptor were tested in rats, dogs, and cynomologous monkeys: (3-((1S,2S)-2-hydrocyclohexyl)-6-((6-(1-methyl-1H-pyrazol-4-yl)pyridin-3-yl)methyl)benzo[h]quinazolin-4(3H)-one; 1-((4-cyano-4-(pyridin-2-yl)piperidin-1-yl)methyl)-4-oxo-4H-quinolizine-3-carboxylic acid; and (R)-ethyl 3-(2-methylbenzamido)-[1,4′-bipiperidine]-1′-carboxylate). Despite their selectivity for the M1 receptor, all three compounds elicited cholinergic side effects such as salivation, diarrhea, and emesis. These effects could not be explained by activity at other muscarinic receptor subtypes, or by activity at other receptors tested. Together, these results suggest that activation of M1 receptors alone is sufficient to produce unwanted cholinergic side effects such as those seen with xanomeline. This has important implications for the development of M1 receptor–targeted therapeutics since it suggests that dose-limiting cholinergic side effects still reside in M1 receptor selective activators. The neurotransmitter acetylcholine activates two distinct families of receptors: nicotinic and muscarinic acetylcholine receptors, which were initially classified based upon their differential activation by the toxins nicotine (Lindstrom 1997) and muscarine (Wess et al., 1996). Nicotinic acetylcholine receptors are ligand-gated ion channels; muscarinic acetylcholine receptors are seven transmembrane guanine nucleotide binding protein (G protein) coupled receptors. Five subtypes of muscarinic acetylcholine receptors exist (M1–M5). These five subtypes each represent separate gene products and exhibit distinct signaling pathways and tissue distribution, although all are expressed within the central nervous system (Ishii and Kurachi 2006). The M1 muscarinic receptors play an important role in multiple domains of cognitive function (Felder et al., 2000; Auld et al., 2002), and a significant body of evidence suggests that activation of M1 receptors can produce therapeutically beneficial effects for the treatment of schizophrenia and Alzheimer’s disease (Langmead et al., 2008). Muscarinic receptor activation has been shown to reverse cognitive and behavioral deficits in animal models of schizophrenia and Alzheimer’s disease, and the M1 receptor specifically has been implicated in mediating these effects (Jones et al., 2005; Langmead et al., 2008; Barak and Weiner 2011; Fisher 2008). The most direct evidence for the utility of M1 activators in treating schizophrenia and Alzheimer’s disease comes from clinical trials using xanomeline, a muscarinic partial agonist with modest selectivity for M1 and M4 receptors. Xanomeline was shown to improve psychosis and behavioral disturbances in Alzheimer’s disease patients (Bodick et al., 1997). Xanomeline was also found to produce both significant psychiatric improvements, and improvements in learning and memory in schizophrenia patients (Shekhar et al., 2008). Unfortunately, the clinical utility of xanomeline is limited by its side-effect profile, which includes salivation, sweating, and gastrointestinal distress—all of which are classic cholinergic side effects. These side effects are believed to be due to activity of xanomeline at M2 and M3 muscarinic receptors (Melancon et al., 2013). Therefore, selectivity has remained the major focus for drug discovery efforts targeting the M1 receptor. However, attaining sufficient selectivity for M1 versus other muscarinic receptors to avoid cholinergic side effects has proven to be very challenging because the acetylcholine binding site is highly conserved within all five muscarinic receptor subtypes (Heinrich et al., 2009), and despite years of medicinal chemistry efforts acetylcholine site activators with sufficient M1 selectivity have not been identified. An alternative pharmacological strategy is to modulate the activity of M1 receptors using molecules that bind to allosteric sites that are distinct from the acetylcholine (orthosteric) binding site. Small-molecule positive allosteric modulators (PAMs) have been identified for many G protein coupled receptors (Wootten et al., 2013), including the M1 receptor (Melancon et al., 2013). Allosteric binding sites do not face the same evolutionary pressure as the orthosteric binding site, which must bind the endogenous agonist to maintain receptor function. Therefore, allosteric binding sites are hypothesized to be less evolutionarily and structurally conserved than orthosteric sites, suggesting that allosteric sites could offer improved opportunities for receptor subtype selectivity versus targeting the traditional orthosteric site of the receptor. This hypothesis has been borne out empirically. For example, small molecules targeting allosteric sites of metabotropic glutamate receptors have been shown to exhibit excellent receptor subtype selectivity, which had not been achieved by ligands targeting the highly conserved glutamate binding site (Nickols and Conn 2014). Similarly, allosteric modulators of muscarinic receptors have been identified that exhibit selectivity superior to that attained by xanomeline or other orthosteric site M1 receptor activators (Melancon et al., 2013). The current study was designed to test the hypothesis that M1-selective compounds would be free of classic cholinergic side effects in animal models. To test this hypothesis, the following three structurally distinct M1 PAMs were chosen from the scientific literature (Kuduk et al., 2011; Lebois et al., 2011): compound A, (3-((1S,2S)-2-hydrocyclohexyl)-6-((6-(1-methyl-1H-pyrazol-4-yl)pyridin-3-yl)methyl)benzo[h]quinazolin-4(3H)-one; compound B, 1-((4-cyano-4-(pyridin-2-yl)piperidin-1-yl)methyl)-4-oxo-4H-quinolizine-3-carboxylic acid; and compound C, (R)-ethyl 3-(2-methylbenzamido)-[1,4′-bipiperidine]-1′-carboxylate (Fig. 1). 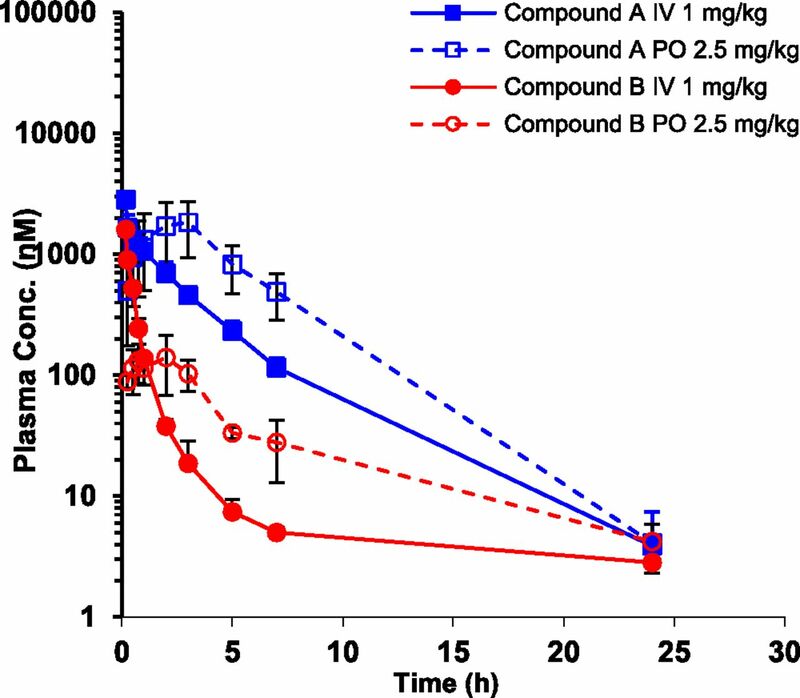 These compounds display potency and pharmacokinetic profiles that make them appropriate for in vivo testing; and, importantly, they show excellent selectivity for M1 over other muscarinic receptor subtypes in vitro. In this study, the safety profile of these selective M1 ligands was investigated in rats, dogs, and cynomologous monkeys. Despite their selectivity for M1, all three compounds were found to produce effects associated with classic cholinergic toxicity such as salivation and diarrhea. Accordingly, these results refute the original hypothesis and instead provide evidence to suggest that activation of the M1 receptor alone is sufficient to produce cholinergic toxicity in animals. Compounds used: compound A, 3-((1S,2S)-2-hydrocyclohexyl)-6-((6-(1-methyl-1H-pyrazol-4-yl)pyridin-3-yl)methyl)benzo[h]quinazolin-4(3H)-one (Kuduk et al., 2011), compound B, 1-((4-cyano-4-(pyridin-2-yl)piperidin-1-yl)methyl)-4-oxo-4H-quinolizine-3-carboxylic acid (Kuduk et al., 2011), and compound C, (R)-ethyl 3-(2-methylbenzamido)-[1,4′-bipiperidine]-1′-carboxylate (VU0364572) (Lebois et al., 2011); 1-(4-methoxybenzyl)-4-oxo-1,4-dihydroquinoline-3-carboxylic acid (BQCA) (Ma et al., 2009) was used as a comparator compound for in vitro experiments. M2, M3, and M4 were recombinantly expressed in a Chinese hamster ovary cell background, with M2 and M4 lines also containing a construct expressing Gqi5 and aequorin. The M1- and M5-expressing cell lines were generated by recombinant expression of M1 or M5 in Chinese hamster ovary A12 cells (Perkin-Elmer, Akron, OH). Cells were cultured in tissue culture–treated T-175 flasks (Corning, Corning, NY) in medium [Dulbecco’s modified Eagle’s medium/F12 (Gibco, Waltham, MA), 10% fetal bovine serum (Hyclone, Logan, Utah), and appropriate selection antibiotics] at 37°C, 5% CO2. Cells were harvested and plated onto 384-well (Corning) tissue culture–treated black/clear plates 16–20 hours prior to the experiment. Briefly, flasks were rinsed with 10 ml/flask Dulbecco′s phosphate buffered saline solution (magnesium and calcium free, Gibco) and incubated in 5 ml/flask of 0.05% trypsin-EDTA (Gibco) at 37°C for 5 minutes. Medium was added to the harvested cells, and then the cells were centrifuged in a tabletop centrifuge at 1200 rpm for 10 minutes. The cell pellet was resuspended in 10 ml/flask medium + 1% penicillin-streptomycin (Gibco), counted on the Guava Personal Cell Analysis System (Guava Technologies, Hayward, CA), diluted with medium + 1% penicillin-streptomycin to a concentration of 1 × 106 cells/ml, and then 20 µl/well (20,000 cells/well) of cell suspension was added and the plates were incubated at 37°C, 5% CO2 overnight. Compounds were solubilized in dimethylsulfoxide (DMSO) (EMD Chemicals, Gibbstown, NJ) at 10 mM and then serially diluted in half-log increments in 384-well polypropylene REMP microplates (Brooks Automation, Chelmsford, MA). An intermediate compound plate was prepared by adding 1 µl/well of each DMSO solution to a REMP plate followed by 100 µl/well of Hanks’ balanced salt solution/20 mM HEPES [Hanks’ balanced salt solution (Gibco) supplemented with 20 mM HEPES (Gibco), pH 7.4]. After overnight incubation, the medium was removed from the cells by flicking the plates, followed by addition of 20 µl/well of 3 µM Fluo4-AM (Invitrogen, Carlsbad, CA), 0.016% pluronic acid (Sigma-Aldrich, Saint Louis, MO), and 2.5 mM probenecid (Sigma-Aldrich) in Hanks’ balanced salt solution/20 mM HEPES. Plates were incubated for 1 hour at room temperature prior to assay in the FLIPR Tetra (Molecular Devices, Sunnyvale, CA). For all additions, the FLIPR Tetra reads a baseline once a second for 10 seconds prior to compound addition, followed by 50 seconds at 1-second intervals and 60 seconds at 3-second intervals. First, the compounds were added from the compound plate to assay for agonist activity and 20 µl/well from the 2× compound plate was added at a height of 10 µl with no mixing. Then, the plates were incubated for 20 minutes at room temperature, and the PAM activity was assayed by adding a 3× solution of acetylcholine from a bulk reservoir to all wells (20 µl/well at 10 µl height with two 10 µl mixes). The solution was adjusted each day to produce an EC10-EC20 response. The ranges of 3× concentrations of acetylcholine used were 15–30 nM for M1, 167–250 nM for M2, 1.67–2 nM for M3, 133–400 nM for M4, and 15–50 nM for M5. Raw data files were exported from the FLIPR ScreenWorks software (Molecular Devices). Maximum fold increase in fluorescence was determined by dividing the maximum value of fluorescence obtained after compound addition by the average of the baseline values taken before compound addition. These values were analyzed using GraphPad PRISM (GraphPad Software, La Jolla, CA). The EC50 values were calculated using nonlinear regression (sigmoidal dose response, variable slope). Selectivity assays for other G protein coupled receptors were performed as standard competitive binding assays using receptor-specific radioligand probes in membrane preparations from cells overexpresssing the various G protein coupled receptors. Phosphodiesterase type 4 activity was determined in an electrophoretic mobility assay, using a fluorescently labeled cAMP as a substrate. By the nature of the difference in electrophoretic mobility of the substrate and the hydrolyzed product, the enzymatic activity was determined upon the electrophoretic separation of the reactions on the caliper (Perkin-Elmer). The activity on GABA (α1β2γ2) was measured by using a cell line expressing a rat GABA (α1β2γ2) and a halide-sensing yellow fluorescent protein. Potentiation of GABA activity was determined by the effect of the test compound to enhance the response produced by an EC20 concentration of GABA. Activity on the cardiac sodium channel was measured using a cell line expressing human NaV1.5 and a voltage-sensitive dye on a flurometric plate reader, where the inhibitory activity of the test compounds was assayed in the presence of veratridine. Test compounds were suspended in 100% DMSO as a 10 mM stock. Five-molar monobasic sodium phosphate was obtained from Sigma-Aldrich. Pooled, male human, male rat, and male mouse sera were obtained from BioReclamation (Hopewell, NJ). The reusable 96-well microequilibrium dialysis device was obtained from HTDialysis (Gales Ferry, CT). Dialysis membrane strips (10,000-Da mol. wt. cutoff) were also obtained from HTDialysis. Acetonitrile, water, and methanol were all obtained from J.T. Baker (Miami, FL). Ammonium acetate, formic acid, and alprenolol were obtained from Sigma-Aldrich. Tolbutamide was obtained from Fluka (Saint Louis, MO). Polymerase chain reaction plates were obtained from Axygen (Union City, CA). Dialysis membranes were soaked for 15 minutes in distilled water at room temperature. After the initial soaking, the water was replaced with 0.133 M sodium phosphate buffer (prepared by dilution of a 5 M stock with distilled water and adjustment to pH 7.4), and the membranes were soaked for an additional 15 minutes in the buffer. Membrane strips were assembled into the high throughput dialysis apparatus according to the manufacturer’s instructions, and 150 μl of 0.133 M sodium phosphate buffer, pH 7.4, was loaded into one side of each dialysis chamber. Test articles and reference compounds (1 mM in 100% DMSO) were added to human, rat, or mouse serum to achieve a final concentration of 10 μM at 1% DMSO. All sera were adjusted to pH 7.4 prior to use. Test and reference compounds in sera (165 μl) were added to the opposite side of each dialysis chamber from the buffer, and 15 μl of compound in serum was immediately removed and added to 135 μl of mixed matrix solution to create the reference sample (T0). The mixed matrix solution consisted of 16.7% human serum, 16.7% rat serum, 16.7% mouse serum, and 50% 0.133 M sodium phosphate buffer. The equilibrium dialysis chamber was incubated at 37°C in a 7% CO2 atmosphere for 6.5 hours. Following incubation, 75 μl from the buffer (dialysate) side of the HTD equilibrium dialysis chamber was added to 75 μl of the mixed serum solution to create the postincubation buffer sample. The mixed matrix solution consisted of 33% human serum, 33% rat serum, and 33% mouse serum. In addition, 15 μl from the serum side of the HTD equilibrium dialysis chamber was added to 135 μl of the appropriate mixed matrix solution to create the postincubation serum sample. The concentrations of test articles and reference compound samples were determined by liquid chromatography–tandem mass spectrometry. The analysis system consisted of two sets of binary Shimadzu 10ADvp pumps with SCL-10Avp controllers for gradient elution, a Leap HTS Autosampler (Leap Technologies, Carrboro, NC) with twin arms for sample injection, a Thermo Fisher Scientific (Waltham, MA) valve interface module for valve switching and stream selection, and an AB Sciex (Framingham, MA) triple quadrupole mass spectrometer operated under electrospray ionization mode. To obtain the optimum selected reaction monitoring conditions for sample analysis, tandem mass spectrometry optimization was performed using DiscoveryQuant featuring saturation control by AB Sciex (Framingham, MA) with 10 μM standard solutions (in 1:1 methanol/water) prepared from the compound stock solutions. The optimization was performed using a flow injection analysis with an injection volume of 40 μl. The mobile phase was 25%A:75%B delivered by an Agilent (Santa Clara, CA) 1100 pump at 0.3 ml/min, where A was a mixture of 2 mM ammonium acetate/acetonitrile/formic acid (980:20:1, v/v/v), and B was a mixture of acetonitrile/water/formic acid (980:20:1, v/v/v). DiscoveryQuant automatically determined the optimized ionization polarity (positive or negative), precursor and product ions, declustering potential, and collision energy for test and reference compounds. All animal studies were performed under the approval of the Bristol-Myers Squibb Animal Care and Use Committee and in accordance with the Association for Assessment and Accreditation of Laboratory Animal Care (AAALAC, Frederick, MD). Pharmacokinetic studies were conducted in male Sprague-Dawley rats (300–350 g) with cannulae implanted in the jugular veins. After dosing, serial blood samples (0.3 ml) were obtained from the appropriate cannula of each rat by collection into EDTA-containing tubes (Becton Dickinson, Franklin Lakes, NJ), and centrifuged to separate plasma. Plasma was frozen until analysis. For the i.v. studies, the compound was dissolved (1 mg/ml) in a vehicle of 10% N-methyl pyrrolidinone, 90% polyethylene glycol (PEG) 400 and dosed (1 ml/kg) as a 10-minute constant rate infusion into the jugular vein, with serial blood samples collected before dosing and at 0.17, 0.25, 0.5, 0.75, 1, 2, 3, 5, 7, and 24 hours after dosing (n = 3 rats/dose group). For solution dosing by mouth, the compound was administered by gastric gavage as an aqueous solution containing 10% N-methyl pyrrolidinone, 85% PEG 400, and 5% d-alpha tocopheryl polyethylene glycol 1000 succinate. Serial blood samples were collected before dosing and at 0.25, 0.5, 0.75, 1, 3, 5, 7, and 24 hours after dosing (n = 3 rats/dose group). Prior to all dosing by mouth, the rats were fasted overnight with free access to water. Pharmacokinetic and tolerability studies were conducted in cynomolgous monkeys bearing vascular access ports to facilitate blood collection in an i.v. rising dose design (n = 2). Vehicle (5% hydroxypropyl beta cyclodextrin; 95% water) was infused at 0.5 ml/kg via the venous port over 5 minutes at a constant rate. Animals were observed for 5 minutes. Then, compound (0.1 mg/kg) was infused for 5 minutes and animals were observed for clinical signs for 1 hour. Blood was taken at the end of infusion (5 minutes) and at 10, 15, 30, and 45 minutes. Body temperature was taken at t = 0, 30, and 45 minutes postdose. At the end of the first observation period (1 hour), compound (0.3 mg/kg) was infused for 5 minutes and animals were observed for 2 hours for clinical signs. Blood was taken at the end of infusion (5 minutes) and at 10, 15, 30, and 45 minutes and 1, 2, 3, 5, and 24 hours postdose. Body temperature was taken at t = 0, 30, and 45 minutes postdose. Plasma prepared from the collected blood samples was stored frozen until analysis. Pharmacokinetic and tolerability studies were conducted in male beagle dogs bearing vascular access ports to facilitate blood collection in an i.v. rising dose design (n = 2). Vehicle (5% hydroxypropyl beta cyclodextrin; 95% water) was infused at 0.5 ml/kg via the venous port over 5 minutes at a constant rate. Animals were observed for 5 minutes. Then, compound (low dose) was infused for 5 minutes and animals were observed for clinical signs for 1 hour. Blood was taken at the end of infusion (5 minutes) and at 15, 30, and 45 minutes. Body temperature was taken at t = 0, 30, and 45 minutes postdose. At the end of the first observation period (1 hour), compound (intermediate dose) was infused for 5 minutes and animals were observed for 1 hour for clinical signs. At the end of the second observation period (1 or 2 hours after the intermediate dose), compound (high dose) was infused for 5 minutes and animals were observed for 2 hours for clinical signs. Blood was taken at the end of infusion (5 minutes) and at 15, 30, and 45 minutes and 1, 2, 3, 5, 7, and 24 hours postdose. Body temperature was taken at t = 0, 30, and 45 minutes postdose. Plasma prepared from the collected blood samples was stored frozen until analysis. Pharmacokinetic parameters were obtained by noncompartmental analysis of plasma concentration versus time data (KINETICA software, Version 2.4, InnaPhase Corporation, Philadelphia). The peak concentration (Cmax) and time for Cmax (tmax) were recorded directly from experimental observations. The area under the curve (AUC) from time zero to the last sampling time (AUC0–t) and the AUC from time zero to infinity (AUCINF) were calculated using a combination of linear and log trapezoidal summations. The whole body plasma clearance, steady-state volume of distribution (Vss), apparent terminal half-life (t1/2), and mean residence time were estimated following i.v. administration. The absolute oral bioavailability (F) was estimated as the ratio of the dose-normalized AUC values following oral and i.v. doses. To assess the in vitro activity and selectivity profile of the M1 PAMs used in this study, these compounds were tested using Chinese hamster ovary cells recombinantly expressing the various muscarinic receptor subtypes (M1–M5). The well-characterized M1 receptor PAM 1-(4-methoxybenzyl)-4-oxo-1,4-dihydroquinoline-3-carboxylic acid (Ma et al., 2009) was also included as a reference for in vitro experiments. The ability of test compounds to either directly elicit increases in intracellular Ca2+ levels [agonist (ago) mode], or to increase the Ca2+ response elicited by a low (∼EC15) concentration of acetylcholine (PAM mode) was measured. Potency (EC50) and Emax values are provided in Table 1. Compounds A, B, and C, and 1-(4-methoxybenzyl)-4-oxo-1,4-dihydroquinoline-3-carboxylic acid all exhibited mixed ago-PAM activity at the M1 receptor (Fig. 2). These compounds potentiated the cellular Ca2+ response to an EC15 concentration of acetylcholine at lower concentrations, while at higher concentrations these compounds exerted allosteric agonist activity, directly activating the receptor even in the absence of orthosteric agonist. In PAM-mode testing, test compounds were preincubated with cells for 20 minutes prior to addition of acetylcholine and measurement of the acetylcholine-evoked Ca2+ response. Under these conditions, compounds that exert direct agonist activity (either orthosteric or allosteric) produce desensitization of the receptor/assay system during this 20-minute preincubation period, inhibiting cellular responses to the subsequent acetylcholine challenge and confounding interpretation of PAM-mode results. Therefore, for compounds A, B, and C, and 1-(4-methoxybenzyl)-4-oxo-1,4-dihydroquinoline-3-carboxylic acid, the PAM-mode curves have been truncated to exclude results at concentrations of test compound that elicit direct allosteric agonist activity (Fig. 2). With the exception of compound A, which exhibited very weak but measurable activity at M2 (Fig. 3), none of the M1 PAMs tested had any measurable agonist or PAM activity at any of the other muscarinic receptor subtypes, M2–M5. Potency (pEC50) and Emax values for muscarinic ligands were determined from their ability to directly induce increases in free cytosolic Ca2+ levels in Chinese hamster ovary cells recombinantly expressing the various muscarinic receptor subtypes (agonist data), or their ability to potentiate the Ca2+ response to an EC15 concentration of acetylcholine (PAM data). Cells expressing M2 or M4 receptors also stably expressed Gqi5 to couple activation of these subtypes to Ca2+ responses. Data represent mean ± S.D. from 3 to 5 experiments. Emax values are relative to a maximal acetylcholine response in the given cell line. Activity of muscarinic ligands at receptor subtype M1. Agonist read (closed symbols): increases in free cytosolic Ca2+ levels were measured immediately upon test compound addition. PAM read (open symbols): 20 minutes subsequent to test compound addition cells were challenged with an EC15 concentration of acetylcholine and free cytosolic Ca2+ levels were again measured, with data expressed as fold increase in free intracellular Ca2+ relative to the control EC15 response. Activity of muscarinic ligands at receptor subtypes M2–M5. Agonist read (closed symbols): increases in free cytosolic Ca2+ levels were measured immediately upon test compound addition. PAM read (open symbols): 20 minutes subsequent to test compound addition cells were challenged with an EC15 concentration of acetylcholine and free cytosolic Ca2+ levels were again measured, with data expressed as fold increase in free intracellular Ca2+ relative to the control EC15 response. We evaluated compounds A, B, and C in concentration-response (30 µM top concentration) in a broad panel of selectivity assays comprising G protein coupled receptors, biogenic amine transporters, ion channels, enzymes, and nuclear hormone receptors (Table 2; Supplemental Tables 1–3). This panel consists of targets that have been implicated in various safety/liability concerns within central nervous, cardiac, pulmonary, renal, immune, gastrointestinal, and reproductive systems. Compound A was noted to have weak inhibitory activity at cardiac sodium channel NaV1.5 (IC50 = 11 µM) and phosphodiesterase type 4 (IC50 = 13 µM). It also was found to bind to the adrenergic α1D receptor, based upon competition in a radioligand binding assay (IC50 = 4 µM). Furthermore, in an assay that measures potentiation of GABA receptor GABAA (α1β2γ2) activity, compound A was observed to potentiate GABA-evoked responses with EC50= 2 µM, with a maximal response that reached a plateau at ∼36% of the maximal GABA-stimulated response. Compound B exhibited very weak binding to androgen (IC50 = 16 µM), estrogen (IC50 = 64 µM), and progesterone (IC50 = 60 µM) receptors. Compound C did not display any measurable activity at any of the 43 targets in this selectivity panel at the concentrations tested. Potency (IC50 or EC50) values are reported for those assays in which the maximal observed response produced by the test compound was greater than or equal to 50% relative to a reference full agonist or inhibitor. Values are otherwise reported as greater than the top concentration tested or half of the top concentration tested. Compounds A, B, and C were tested in a serum protein binding panel using human, rat, and mouse serum. These compounds exhibited a wide range of protein binding. Compound A was found to be highly (>99%) protein bound in human and rodent serum, while compounds B and C exhibited high free fractions in serum (Table 3). Data reported represent mean and S.D. from three determinations; %Rec. denotes percent recovery. Compound A was dosed i.v. (1 mg/kg) as a clear colorless solution in N-methyl pyrrolidinone:PEG 400 (10:90) and orally (2.5 mg/kg) in N-methyl pyrrolidinone:PEG 400:d-alpha tocopheryl polyethylene glycol 1000 succinate (10:85:5). Plasma was sampled out to 24 hours (Fig. 4; Table 4). Following i.v. administration of compound A at 1 mg/kg in the rat, a low clearance (8.4 ml/min/kg) and a high volume of distribution (1.7 l/kg) were observed. The resulting half-life was moderate at 3.2 hours. Following oral administration (2.5 mg/kg) a Cmax of 1.9 μM was observed 2.7 hours postdose. The AUC (0–24 hours) was 9.6 μM·h. Bioavailability of compound A was 86% following oral dosing. It should be noted that some variation was observed in the individual rats after oral dosing. Following oral and i.v. administration, all rats had diarrhea between 45 minutes and 1 hour postdose. No other clinical observations were noted for the remainder of the study, except for bright yellow urine 24 hours postdose in the cages of animals that were dosed orally. Plasma exposure of compounds A and B in rats following i.v. (1 mg/kg) and oral (5 mg/kg) administration. Compound B was dosed in rat using the same study design as compound A. Following i.v. administration of compound B at 1 mg/kg in the rat as a clear yellow solution, a high clearance (59 ml/min/kg) and a high volume of distribution (6.1 l/kg) were observed (Fig. 4; Table 4). The resulting half-life was moderate at 4 hours (individual rat half-life varied from 1.6 to 8.6 hours). Clearance (13.5 ml/min/kg) was much higher compared with previously reported values (Kuduk et al., 2011). Following oral administration of compound B at 2.5 mg/kg, the Cmax, tmax, and AUC0-tot values were 0.2 μM, 1.0 hour, and 0.7 μM·h, respectively. The bioavailability of compound B was 39%, which is lower compared with previously reported values (Kuduk et al., 2011). No clinical observations were noted other than bright yellow urine found in the bedding from all animals postdose. Compound A was dosed i.v. in a dose escalation study at 0.1 and 0.3 mg/kg as described in Materials and Methods. Plasma concentration measurements are shown in Fig. 5, and pharmaokinetic properties are summarized in Table 5. Pharmacokinetic parameters were not calculated for the 0.1 mg/kg dose group due to the short time interval (<1 hour). Although the plasma levels of compound A were somewhat higher for the second dose as a result of the first dose, the expected contribution was calculated to be minimal (< 10%). Following i.v. administration at 0.3 mg/kg, compound A had low clearance (4.6 ml/min), moderate Vss (0.9 l), and moderate t1/2 (3.2 hours). Plasma Cmax (5 minutes postdose) was 2.3 μM and declined to 1.0 μM by 15 minutes postdose. 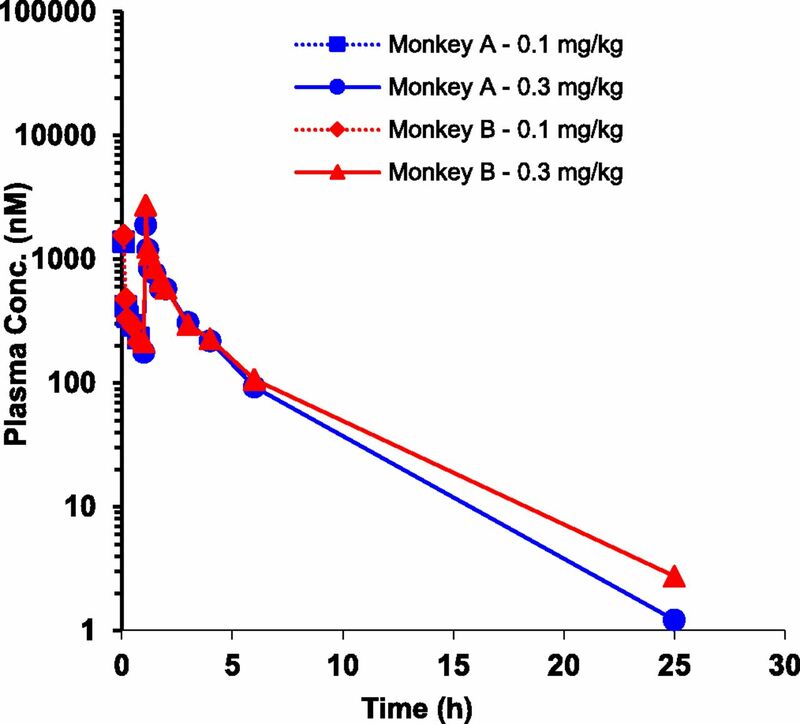 No effects were observed in the monkeys following administration of vehicle and the 0.1 mg/kg dose. At 0.3 mg/kg, nasal discharge and hypersalivation were observed in one monkey from approximately 5 to 15 minutes postdose. In the other animal, hypersalivation, emesis (single episode), urination (single episode), and miosis were observed from approximately 5 to 20 minutes postinfusion. Plasma exposure of compound A in monkeys following i.v. administration at 0.1 mg/kg, followed by 0.3 mg/kg 1 hour after the first dose. Compound B was dosed i.v. in a dose escalation study at 1 and 3 mg/kg as described in the Materials and Methods. Plasma concentration measurements are shown in Fig. 6, and pharmacokinetic parameters are summarized in Table 6. Pharmacokinetic parameters were not calculated for the 1 mg/kg dose, due to the short time interval (<1 hour). Following administration at 1 mg/kg, both dogs had slight drooling approximately 4 minutes into the infusion; no other symptoms were observed. Exposures at the end of infusion were 2.6 and 3.1 µM. Although the plasma levels of compound B were somewhat higher for the second dose as a result of the first dose, the expected contribution was calculated to be minimal (<10%). Following i.v. 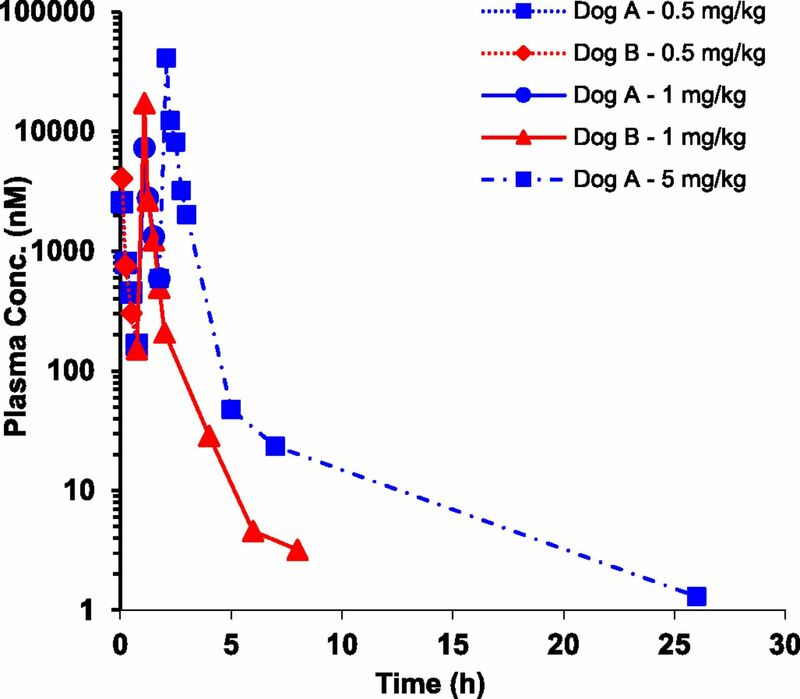 administration in one dog at 3 mg/kg, compound B had low clearance (10 ml/min), high Vss (3.6 l), and long t1/2 (6.4 hours). Three minutes into the infusion, nasal discharge, licking lips, and salivation were visible. Severe salivation was noted at end of the infusion (5 minutes). Exposure at the end of administration was 16 µM. Vomiting was observed between 7 and 9 minutes postdose. Severe diarrhea was observed between 8 and 17 minutes postdose. Ataxia was observed from 11 to 50 minutes postdose, starting with abnormal stance with front legs straight and back legs splayed behind. Ataxia was severe by 20 minutes postdose, with complete loss of hind end control and knuckling on front feet. Ataxia lessened by 29 minutes postdose, with the dog walking in circles. The dog was alert and exploring by 50 minutes postdose, with no other adverse events noted after 1 hour postdose. Exposure was 2.2 µM at the 1 hour time point. Due to the severe effects in the first dog, the infusion for the second dog was stopped after 2.5 minutes, resulting in a lower dose of 1.5 mg/kg. Mild salivation and licking was observed after 2 minutes of infusion. No other adverse events were noted. Exposure at the end of infusion was 5.2 µM. 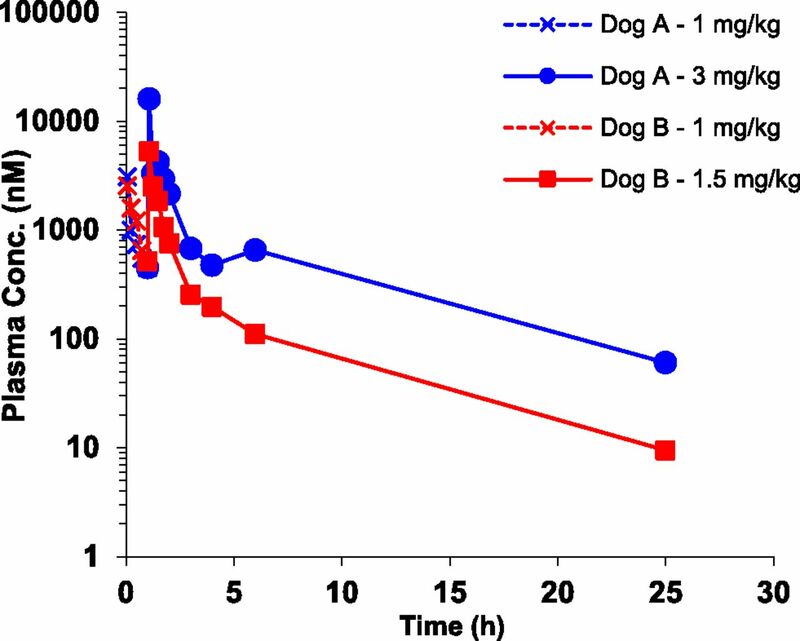 Pharmacokinetic parameters for this dog were similar to the first dog with a Vss of 3.6 l/kg and a t1/2 of 5.0 hours, but clearance was somewhat higher (17 ml/min/kg). Plasma exposure in dogs following i.v. administration of compound B at 1 mg/kg in dogs A and B, followed by 1.5 mg/kg (dog B) or 3 mg/kg (dog A) 1 hour after the first dose. Compound C was dosed in the same manner as compound B with a 5-minute infusion of 0.5, 1, and 5 mg/kg with 1 hour observation between doses. Plasma concentration measurements are shown in Fig. 7, and pharmaokinetic parameters are summarized in Table 7. Following the vehicle and 0.5 mg/kg dose, no adverse events were noted. Exposures at the end of the infusion were 2.6 and 4.1 µM. Clearance was high at 31–35 ml/min/kg, Vss was moderate (0.5–0.7 l/kg), and t1/2 was short (0.2 hours). Following administration at 1 mg/kg, slight clear nasal discharge was observed in both animals approximately 3 to 4 minutes into the infusion. One animal also experienced hypersalivation and decreased activity. Exposures at the end of the infusion were 7.3 and 17.3 µM. Both dogs had no other symptoms by 5 minutes postdose. Only 1 dog was administered the 5 mg/kg dose. Decreased activity, licking, and excessive hypersalivation were noted 2.5 minutes after the start of the infusion with moderate nasal discharge. By the end of the infusion, dilated pupils, clear ocular discharge, and slight ataxia with a wide stance were observed in addition to hypersalivation and licking. Symptoms abated rapidly, with no further observations by 20 minutes postdose. A summary of the observed in vivo effects in all species is provided in Table 8. Plasma exposure of compound C in dogs following i.v. administration at 0.5 mg/kg, followed by 1 mg/kg 1 hour postdose (dogs A and B) and 5 mg/kg 2 hour postdose (dog A). A significant body of research exists to support the potential therapeutic efficacy of M1 agonists for treating cognitive disorders such as schizophrenia and Alzheimer’s disease. M1 agonists have been shown to reverse cognitive deficits in animal models (Jones et al., 2005; Langmead et al., 2008; Barak and Weiner 2011), and more importantly the M1 agonist xanomeline has been shown to produce beneficial psychiatric and cognitive effects in human patients (Bodick et al., 1997; Shekhar et al., 2008). Unfortunately, xanomeline also produces serious side effects including salivation, sweating, and gastrointestinal distress. Although xanomeline had originally been reported to be highly selective for M1 over other muscarinic receptor subtypes based upon ex vivo studies (Sauerberg et al., 1992; Shannon et al., 1994), subsequent studies using cloned human muscarinic receptors suggested that xanomeline exhibits very little selectivity among the five muscarinic receptor subtypes (Watson et al., 1998; Wood et al., 1999). Therefore, the untoward side-effect profile of xanomeline has been attributed to nonselective activity at other muscarinic receptor subtypes, in particular M2 and M3 (Mirza et al., 2003). Recently, the identification of small molecules that bind to allosteric binding sites that are distinct from the (orthosteric) endogenous agonist binding site has emerged as a strategy for targeting G protein coupled receptors (Wootten et al., 2013). Allosteric modulators have several potential advantages over traditional orthosteric ligands (Wootten et al., 2013), including the potential for improved receptor subtype selectivity. Indeed, the M1 PAMs used in the current study show exquisite functional selectivity for M1 over other muscarinic receptor subtypes in vitro (Figs. 2 and 3; Table 1). Therefore, it was surprising that all three of the M1 PAMs tested produced in vivo effects consistent with cholinergic toxicity, such as hypersalivation, vomiting, and severe diarrhea. These effects are reminiscent of the side effects seen in humans during clinical trials with xanomeline (Bodick et al., 1997; Shekhar et al., 2008), suggesting that some or all of xanomeline’s adverse effects may in fact be mediated by activation of the M1 receptor itself, rather than by other muscarinic receptor subtypes, as had been previously assumed. It is important to note that, in this study, the in vitro assays used to assess selectivity of the test compounds for M1 versus the other muscarinic receptor subtypes used cells recombinantly expressing each of the muscarinic receptors. Furthermore, in the case of the M2- and M4-expressing cell lines, the mutant G protein Gqi5 was coexpressed to force coupling of the M2 and M4 receptors to a Ca2+ mobilization pathway instead of their natural Gi-mediated coupling to inhibition of adenylyl cyclase. Therefore, the cellular models used for selectivity assessment represent highly artificial systems. While these recombinant systems afford excellent sensitivity and reproducibility of data generated, it is possible that artificial G protein coupling or other differences from the receptors’ native neuronal environment could lead to results that do not reflect the true activity of these compounds in vivo, and this caveat must be kept in mind when interpreting these results. The M1 PAMs used in this study were profiled in an in vitro safety panel measuring activity at 43 G protein coupled receptors, ion channels, transporters, nuclear hormone receptors, and enzymes (Table 2). Compound A showed some measurable activity at several of the receptor targets in this panel: the α1D-adrenergic receptor, the GABAA receptor, phosphodiesterase 4, and the cardiac sodium channel NaV1.5. However, compound A exhibited only very low potency (2–13 μM) at each of these targets. Compound B showed some binding activity at androgen, estrogen, and progesterone receptors, but again with very low (16–64 μM) potency. Compound C showed no significant activity at any of the targets in this panel. It is important to note that many of these selectivity assays (e.g., radioligand binding–based assays) would not be expected to detect potential allosteric modulation of the receptor tested. However, with this caveat, these results—combined with the similarity of the in vivo toxicity profile observed with compounds A, B, and C—again support the conclusion that the toxic effects observed in the current study were mediated by M1 receptors rather than by some off-target activity of the compounds. It is common for PAMs to also exhibit direct agonist activity at higher concentrations (Schwartz and Holst 2006, 2007; Bridges and Lindsley 2008; Burford et al., 2011). Such compounds are commonly referred to as ago-PAMs (Noetzel et al., 2012). Indeed, all three of the M1 PAMs used in the current study were found to exhibit direct agonist activity at concentrations approximately 50- to 100-fold higher than those required for PAM activity in vitro (Fig. 2; Table 1). Ago-PAMs and pure PAMs (those with no direct agonist activity) can show differential activity in vivo (Bridges et al., 2013; Rook et al., 2013). This may in part reflect the ability of PAMs to maintain the temporal and spatial fidelity of native signaling because pure PAMs do not activate the receptor on their own. They exert an effect only when and where the native agonist is present, thereby preserving some aspects of native receptor signaling and its physiologic regulation, and thus might be expected to avoid some side effects associated with direct activation of the receptor (for reviews, see Wootten et al., 2013; Burford et al., 2015). Within this context, it is interesting to note that the doses in this study, which produced adverse events in vivo, generally attained relatively high (i.e., micromolar) plasma exposure levels in test animals. At these concentrations, the M1 PAMs tested may be producing direct agonism at the receptor in vivo, based upon their in vitro profiles (Fig. 2; Table 1). Additionally, the fact that the side effects were transient further suggests that these side effects resulted from high concentrations of the compounds. Therefore, this raises the intriguing possibility that direct activation of M1 is required to produce the unwanted cholinergic side effects observed, and that pure M1 PAMs, or ago-PAMs administered at doses below those required for direct receptor agonism, could still be safe, and therefore the identification of M1 PAMs with acceptable safety margins may be possible. Within this context, it should be noted that compound B from this study has also been tested in vivo by Kuduk et al. (2011), who also reported that the compound is selective against other muscarinic receptor subtypes, in addition to being selective against a wide panel of other targets, in agreement with the current study. This group has further reported that compound B did not produce significant gastrointestinal or salivation disturbances at doses up to five times greater than those that produced procognitive effects in rhesus monkeys, suggesting that a therapeutic window between beneficial and undesired effects can be achieved (Vardigan et al., 2015). Furthermore, compound B was shown to produce synergistic procognitive effects when combined with either the muscarinic agonist xanomeline, or the acetylcholinesterase inhibitor donepezil, suggesting combination therapy as another potential strategy for achieving acceptable safety margins with M1-targeted therapeutics. The current study does not include testing in cognition models, and was not designed to gauge safety margins. Instead, the current study was designed to test the hypothesis that selective activation of the M1 receptor alone would be insufficient to produce classic cholinergic toxicity. Our results refute this hypothesis. Toxic effects were observed in rats, dogs, and cynomologous monkeys. These effects were similar across the species tested, and were produced by three different M1 receptor PAMs. Furthermore, these effects are similar to those seen in clinical trials using the M1 agonist xanomeline. 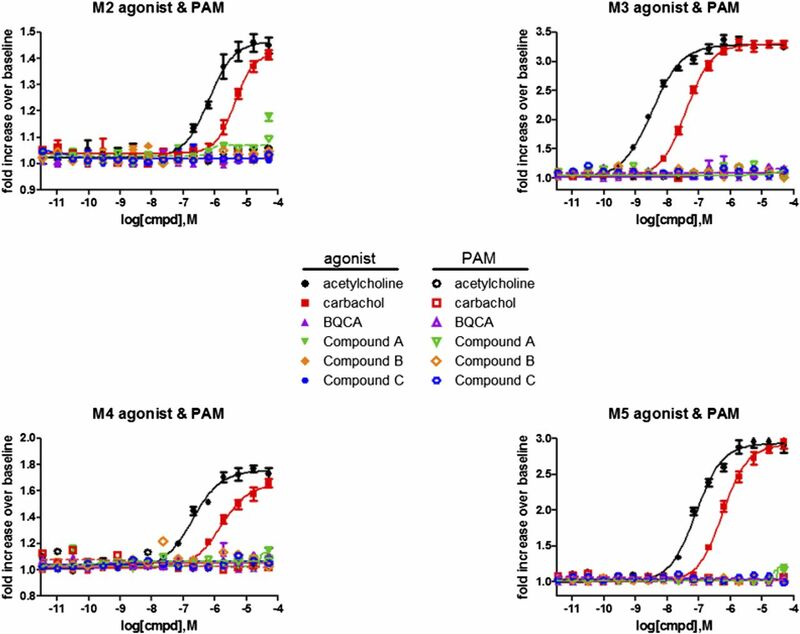 All three of the M1 PAMs used in this study exhibited excellent selectivity for M1 over other muscarinic receptor subtypes in vitro, and in a safety panel no off-target activity was detected for these compounds, which would explain the toxic effects observed. Based upon these combined results, we now hypothesize that activation of the M1 receptor alone is sufficient to produce a cholinergic toxicity syndrome. This has important implications for the development of M1-targeted therapeutics since it would suggest that dose-limiting cholinergic side effects such as those observed in clinical trials with xanomeline cannot be completely avoided simply by the use of drugs that exhibit greater selectivity for the M1 receptor versus other muscarinic receptor subtypes. Finally, it should be noted that a novel allosteric M1 agonist, HTL9936, has been investigated in a phase 1 clinical trial as a potential treatment of cognitive impairment associated with Alzheimer’s disease (http://clinicaltrials.gov/ct2/show/NCT02291783), and was reported to be well tolerated in this study. It will be of great interest to see whether this initial report is replicated, and whether the central nervous system exposure levels achieved in this safety study are sufficient to produce therapeutic effects. Therefore, future clinical studies using HTL9936 are expected to provide additional insight into the side-effect liabilities associated with M1 receptor activation in humans. The authors thank Reshma Panemangalore, Rudy Krause, Jeremy Stewart, Lizbeth Gallagher, Glen Farr, Michele Matchett, and Ron Knox for the execution of various in vitro selectivity assays. Participated in research design: Alt, Pendri, Cvijic, Westphal, O’Connell, Zhang, Gentles, Jenkins, Loy, Macor. Conducted experiments: Bertekap, Benitex, Nophsker, Rockwell, Burford, Sum, Chen, Herbst, Ferrante. Contributed new reagents or analytic tools: Pendri, Li, Gentles. Performed data analysis: Alt, Bertekap, Benitex, Nophsker, Rockwell, Burford, Sum, Chen, Herbst, Ferrante, Hendricson, Jenkins, Loy. Wrote or contributed to the writing of the manuscript: Alt, Pendri, Sum, Herbst, Banks, Jenkins, Loy, Macor. (2002) Alzheimer’s disease and the basal forebrain cholinergic system: relations to β-amyloid peptides, cognition, and treatment strategies. Prog Neurobiol 68:209–245. (2011) The M₁/M₄ preferring agonist xanomeline reverses amphetamine-, MK801- and scopolamine-induced abnormalities of latent inhibition: putative efficacy against positive, negative and cognitive symptoms in schizophrenia. Int J Neuropsychopharmacol 14:1233–1246. (2008) G-protein-coupled receptors: from classical modes of modulation to allosteric mechanisms. ACS Chem Biol 3:530–541. (2013) Biotransformation of a novel positive allosteric modulator of metabotropic glutamate receptor subtype 5 contributes to seizure-like adverse events in rats involving a receptor agonism-dependent mechanism. Drug Metab Dispos 41:1703–1714. (2015) Positive allosteric modulators of the μ-opioid receptor: a novel approach for future pain medications. Br J Pharmacol 172:277–286. (2011) Strategies for the identification of allosteric modulators of G-protein-coupled receptors. Biochem Pharmacol 81:691–702. (2000) Therapeutic opportunities for muscarinic receptors in the central nervous system. J Med Chem 43:4333–4353. (2008) M1 muscarinic agonists target major hallmarks of Alzheimer’s disease--the pivotal role of brain M1 receptors. Neurodegener Dis 5:237–240. (2009) Pharmacological comparison of muscarinic ligands: historical versus more recent muscarinic M1-preferring receptor agonists. Eur J Pharmacol 605:53–56. (2006) Muscarinic acetylcholine receptors. Curr Pharm Des 12:3573–3581. (2005) Pharmacologic interactions between the muscarinic cholinergic and dopaminergic systems in the modulation of prepulse inhibition in rats. J Pharmacol Exp Ther 312:1055–1063. (2011) Discovery of a selective allosteric M1 receptor modulator with suitable development properties based on a quinolizidinone carboxylic acid scaffold. J Med Chem 54:4773–4780. (2011) Development of a highly selective, orally bioavailable and CNS penetrant M1 agonist derived from the MLPCN probe ML071. Bioorg Med Chem Lett 21:6451–6455. (1997) Nicotinic acetylcholine receptors in health and disease. Mol Neurobiol 15:193–222. (2009) Selective activation of the M1 muscarinic acetylcholine receptor achieved by allosteric potentiation. Proc Natl Acad Sci USA 106:15950–15955. (2013) Allosteric modulation of the M1 muscarinic acetylcholine receptor: improving cognition and a potential treatment for schizophrenia and Alzheimer’s disease. Drug Discov Today 18:1185–1199. (2003) Xanomeline and the antipsychotic potential of muscarinic receptor subtype selective agonists. CNS Drug Rev 9:159–186. (2014) Development of allosteric modulators of GPCRs for treatment of CNS disorders. Neurobiol Dis 61:55–71. (2012) Functional impact of allosteric agonist activity of selective positive allosteric modulators of metabotropic glutamate receptor subtype 5 in regulating central nervous system function. Mol Pharmacol 81:120–133. (2013) Unique signaling profiles of positive allosteric modulators of metabotropic glutamate receptor subtype 5 determine differences in in vivo activity. Biol Psychiatry 73:501–509. (1992) Novel functional M1 selective muscarinic agonists. Synthesis and structure-activity relationships of 3-(1,2,5-thiadiazolyl)-1,2,5,6-tetrahydro-1-methylpyridines. J Med Chem 35:2274–2283. (2006) Ago-allosteric modulation and other types of allostery in dimeric 7TM receptors. J Recept Signal Transduct Res 26:107–128. (2007) Allosteric enhancers, allosteric agonists and ago-allosteric modulators: where do they bind and how do they act? Trends Pharmacol Sci 28:366–373. (1994) Xanomeline: a novel muscarinic receptor agonist with functional selectivity for M1 receptors. J Pharmacol Exp Ther 269:271–281. (2015) Improved cognition without adverse effects: novel M1 muscarinic potentiator compares favorably to donepezil and xanomeline in rhesus monkey. Psychopharmacology (Berl) 232:1859–1866. (1998) Functional effects of the muscarinic receptor agonist, xanomeline, at 5-HT1 and 5-HT2 receptors. Br J Pharmacol 125:1413–1420. (1996) Molecular aspects of muscarinic receptor assembly and function. Prog Brain Res 109:153–162. (1999) Functional comparison of muscarinic partial agonists at muscarinic receptor subtypes hM1, hM2, hM3, hM4 and hM5 using microphysiometry. Br J Pharmacol 126:1620–1624. (2013) Emerging paradigms in GPCR allostery: implications for drug discovery. Nat Rev Drug Discov 12:630–644.